Dakota Hudson, plays for the Cyclones and Sequatchie County. 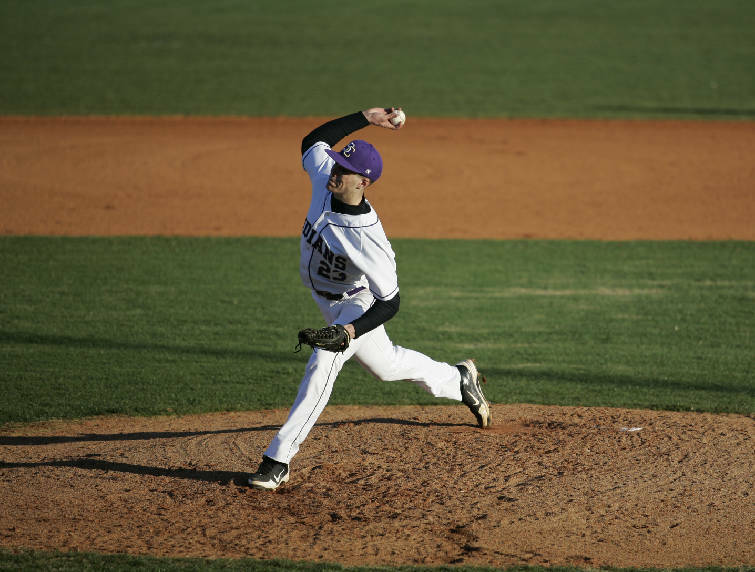 Sequatchie County pitcher Dakota Hudson pitches during a game against Silverdale on March 13 at Sequatchie County High School. A group of scouts was there to watch Hudson pitch. Chris Kemp may have given his club a leg up on the rest of the major league baseball teams when the annual player draft resumes after lunch today. The first two rounds and the compensation picks took place Thursday night. 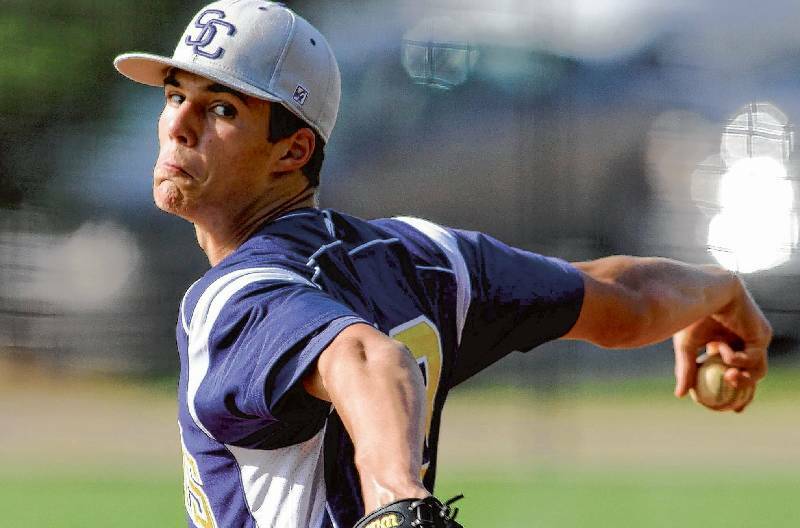 One of the Texas Rangers' regional scouts and a former University of Tennessee standout second baseman, Kemp showed up Sunday in Boone, N.C., to get a final look at Sequatchie County High Schol pitcher Dakota Hudson. The 6-foot-5, 200-pounder showed out, his fastball repeatedly clocking 89-93 mph and getting as high as 95 in a six-inning two-hitter for the Chattanooga Cyclones. "It was the first time he'd pitched in a game since the high school season was over and probably the best I've seen him pitch in three-four months," said Aaron Simmons, his coach at Sequatchie County and also for the Cyclones. "He was the freshest and loosest I've seen him in three or four months." Hudson is a projected selection in rounds 4-10, so he might know today whether he'll have a decision to make. Rounds 3-10 are scheduled today, and then rounds 11-40 are Saturday afternoon and evening. "I'll have the phone handy," he said. "He probably won't put it down," Simmons added. While Simmons has talked with representatives from eight to 10 teams in the last week, the Rangers have been the most persistent. "I have no clue about any of it," Hudson responded when asked if he had an estimate about when, where or if he'd get drafted. "I'm excited. It's a little nerve-racking but I have options, so I'm having fun with it." Like a number of high school candidates, Hudson has a scholarship in hand, and his is from traditional college baseball power Mississippi State. "To Dakota, I don't think it's the money so much as when and who," Simmons said. "It depends on the situation and how he likes it. If he doesn't like the situation he's presented with, then he'll go to Mississippi State." The scouts have seen what MSU and other college recruiters saw. He is tall and still growing, having sprouted six inches since his freshman year when he tried out for Sequatchie's team as a catcher. He never pitched until his sophomore year and has developed a fastball that has jumped from 87-89 into a heavy wind last fall at a camp in Jupiter, Fla., to one consistently in the low 90s. At a Rangers' tryout in North Carolina, the college catcher working with him had trouble catching his curve, which he didn't start throwing until the summer before his junior year. The biggest improvement from last year, though, came in control and demeanor. "He used to get frustrated, and that was one thing we concentrated on," Simmons said. Hudson struck out 124 while walking just 16 this past school season. "I guess I'm locating my fastball a lot better," he said. "Last year I was leaving it over the plate. My offspeed stuff (curve) has gotten move movement, and I can throw all three pitches (fastball, curveball and changeup) for strikes." So the question that remains is whether he'll try to perfect his game in Starkville, Miss., or with a professional organization.